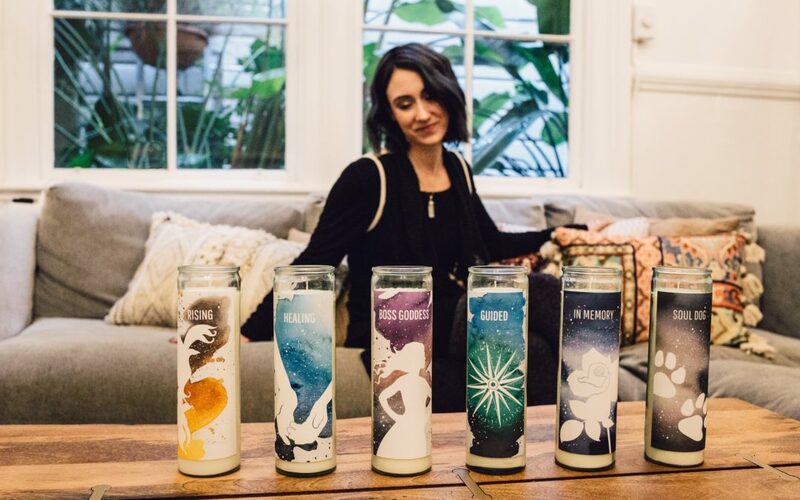 I am so excited to announce the launch of my first product line, Altar Ego, which features sustainably made and beautifully designed altar candles! 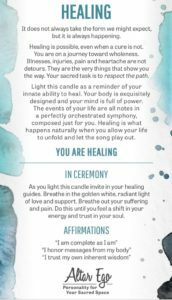 I was inspired by my own experience of healing through grief to create tools to help people access the healing power of ceremony and ritual in a modern and accessible way. Most cultures recognize that ceremony is healing and ritual is soothing for the soul. The good news is you don’t have to belong to a particular religion or tradition to tap into this magic. I did not grow up in any religious tradition and for most of my life felt like I was “not allowed” to benefit from things like ceremony or prayer. Discovering yoga opened my mind and heart to the universally healing power of ritual and provided a context for my spirituality. I have since studied and drawn upon multiple spiritual traditions to craft the practices that work best for me to center myself in love and connect with spiritual power. What I have learned throughout this journey is that ceremony and ritual don’t have to be stuffy, boring or prescribed — in fact, they can be quite the opposite. Whether you feel constricted by the traditions of your childhood, disconnected or downright intimidated by the idea of creating a spiritual practice — I hope my story and these products inspire you to create your own sacred space in whatever way works for you (pssssst –it can be sassy, modern and unique if that’s what you like!). 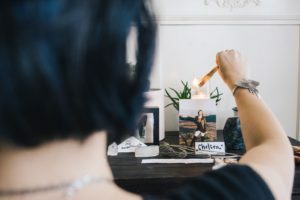 Lighting a candle creates a container for spending time in a sacred space and keeping an altar is a great way to incorporate ritual into your life. An altar can be something as simple as a special corner of a dresser, shelf or bedside table. It’s not about looking any particular way, but rather creating an intentional space of reverence in your home (or on the go!). The items you place on an altar are infused with energy and meaning. Connecting with these items is a way to help your inner sacredness find a home in the physical world. Cool, right? 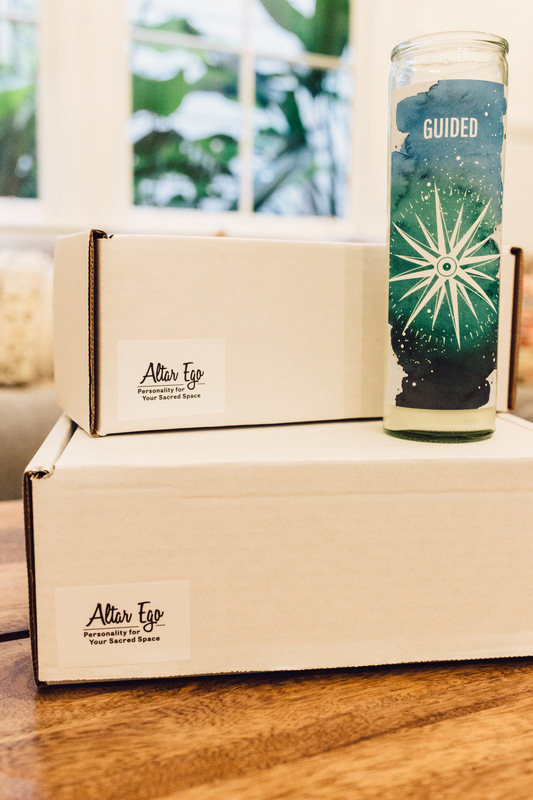 Each Altar Ego candle has a different theme and contains guidance for using it in ritual. 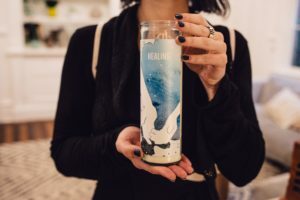 You can light the candle to infuse a room with its energy, recite the related affirmations, follow the instructions for a personal ceremony or create a practice of your own. 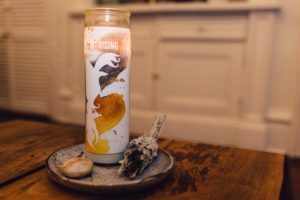 The Rising candle contains the medicine of the Phoenix and reminds us of our ability to reinvent and renew ourselves over and over, no matter how daunting the circumstances we face. We can always burn everything to the ground and start over. This candle is great for providing an anchor for inspiration in times of challenge, remembering superpowers and celebrating re-birthdays. There is nothing more universal than our journeys toward wholeness. Healing is what we are all here to do. The Healing candle reminds us that we have been designed for it. Prepared for it. Healing is always happening even when it feels like it is not. This candle is wonderful for providing solace and calling in grace during times of illness, heartache or pain. The patriarchal spell is lifting. Powerful women (and other Goddess-identifying individuals) who know their worth will change and heal the world. 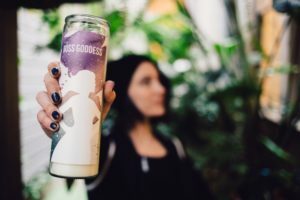 The Boss Goddess candle provides strength and motivation for the baddass, change-making, shape-shifting, edge-walking, Healer-Priestess-Goddess-Queens among us. This candle helps activate natural gifts and draws in instruction for using them to serve the Universe and save the world. Boom. It can be easy to forget that we are surrounded by personalized support in every single moment. But we are. 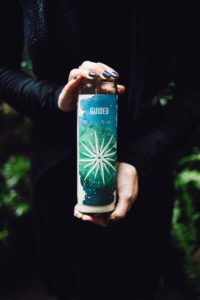 The Guided candle reminds us of this and opens our senses to noticing the signs leading us to our next move. This is good as an everyday reminder or for strengthening faith in times of uncertainty and change. Oh goodness. If we even understood a fraction of how loved we are we would never worry about anything ever again. The Loved candle reminds us what we are made of and why being deeply loved is our birthright. There is nothing we could do that would diminish the amount of love that is trying to flood our lives, but a whole lot we can do to get better at letting it in. This candle realigns us with our true nature. This is supportive for daily life and healing in times of heartache or sorrow. Loss is a doozy. Even though it is a universal and unavoidable part of the human journey, most of us feel completely isolated when it happens to us and not confident in supporting someone we love when it happens to them. Creating an altar space for a lost loved one or pet can be extremely comforting and healing. Lighting a memorial altar candle is a nice marker for spending time in this space. 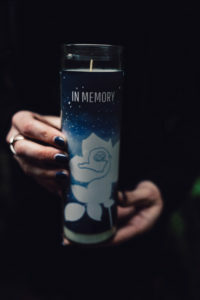 The In Memory candle serves as a physical anchor for the energy of a lost loved one and provides guidance in navigating grief. This can be a powerful tool for your own journey or a very thoughtful gift for someone you care about. Losing a sacred animal companion is uniquely painful. 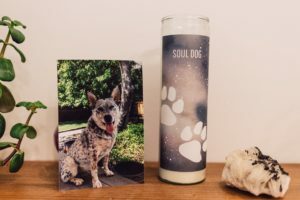 The Soul Dog candle provides guidance in celebrating the special life of a dog and healing the grief that comes with the loss of their form. This is a wonderful gift for anyone who has lost a beloved dog. Website ordering is coming soon! For now, you can email me (melissa@fordeonfire.com), use the contact form below or send me a DM on social media to place an order. $8 flat shipping and free shipping for orders of 3 candles or more.